By clicking on a behavior or disease below, you can quickly see the impact of 3-4-50 in Vermont with the Public Health Data Explorer. A tool to track how well we are doing at prevention. Updated with 2016 Vermont BRFSS and 2015 Vital Statistics numbers. Chronic diseases affect the quality of life for Vermonters as well as Vermont’s economic future. 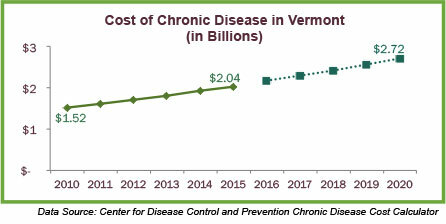 Chronic diseases are projected to cost Vermont over $2 billion in health care costs this year alone. Most chronic disease deaths are from the four diseases included in 3-4-50. The same three behaviors, lack of physical activity, poor diet, and tobacco use, can also make other chronic diseases worse including Alzheimer’s, Parkinson’s and liver disease.